This won’t be a theme you’re going to want to pick up and use without tweaking, that is, without creating a stylesheet for it. It’s a theme for developers (not a developer? keep reading because you’ll want this theme too) and well, one developer in particular: me. I want a theme that I can use as a template for some of my simpler custom work. Something ready for more CSS-only styling than what the Sandbox offers. 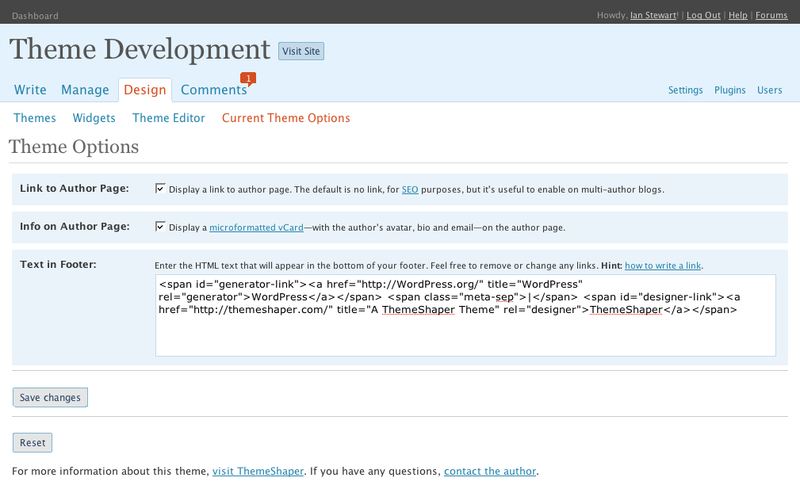 Something that will be easy to upgrade when advances happen in WordPress theming or when bugs are fixed. Something that blows every other base or foundational blogging theme out of the water with features (but manages to stay incredibly lean and not at all bloated, in a not-k2 sort way). What? I can’t think big? I’m also hoping to follow along with some of Small Potato’s personal standards for paid WordPress themes (except this will be a free theme). He earned a reputation for a reason. His personal standards are one of the reasons. But I’ll only be following up to a point though. I have my own opinions of course. Anyway, you’re not a theme developer but you’re excited about this theme? Great! You’ll want to use the skin for this theme I’m working on. It installs just like any other WordPress theme. All it needs is my development theme sitting alongside it in the themes folder. Pretty simple stuff. More to come of course. What do you think? Bonus: I always like to have something of value to you in every post. So: all the theme options you’ll ever need. There. I feel better now. IAN! This sounds AWESOME! As soon as WP 2.5 dropped I created something just like this — Sandbox meets Blueprint meets all of my trusty widgetized plugins. I never once thought about developing it into a full theme; let alone adding theme options and things of that nature. Can’t wait to test your version out, though i’m sure yours will completely trump my version…LOL…Great work as usual! This sounds like a great idea – I’m looking forward to the release. Allan, I don’t know, maybe our themes could arm wrestle or something. For sure yours would be cooler than mine. BTW, I’ve already tried to frighten Scott Wallick (Sandbox co-creator) with this/get him to talk me out of this. It didn’t work. In fact, he helped me get my microformatted vCard working. It must have been some kind of reverse psychology move or something. This sounds like something I’d definitely use. I’ve been looking for a good, idiot-friendly way into the Sandbox for some time. I’ve got a much nicer, 2.5-friendlier functions.php that I’m just about ready to release. Want in on it? Dave, actually Sandbox isn’t that difficult to get into. You should try it out. Heavy CSS editing is actually kinda fun. Waitaminute. What did I just say? Doug, that sounds cool! I’m in. This is fantastic! It looks like you are including many features from my personal “dream theme” (skinnable / Sandbox, microformats, grids, established best practices…and “free”– that’s definitely a dream feature). I’m not a developer (so far), but I have tweaked my style sheets (they’re nowhere near done), and as you said, Trying things is fun. I can’t wait to start playing with it! And as for the theme options link–that’s just lagniappe. And this theme won’t be too far off from Sandbox’s markup. It shouldn’t be hard to adapt an existing stylesheet. I do not like sandbox for a few reasons and hopefully you will improve the good idea! Well, like I said, I can’t improve on Sandbox, just change it. You may like it better though. Any time I think of “improving” Sandbox I imagine Andy Skelton and myself in a rap battle, you know like from Eight Mile? And he’s rattling off PHP functions, defining arrays, etc. Then it comes to my turn and, well, it’s not pretty. Hey Elliot, it’s in a sorry state right now (with markup sure to change) but you can check it’s beginnings on Google Code. You’ve got a development theme coming too, right? Any update on this promise? Yep. Version 0.2 is available on Google Code. Version 0.3 will be released very soon and have a fancy landing page and everything. You can check it out as-is via subversion. Thanks for this project, Ian. I’ll try it out.